What is the Vyatta ? The free community Vyatta Core software(VC) is an open source network operating system providing advanced IPv4 and IPv6 routing, stateful firewalling, IPSec and SSL OpenVPN, intrusion prevention, and more. When you add Vyatta to a standard x86 hardware system, you can create an enterprise grade network appliance that easily scales from DSL to 10Gbps. Vyatta is also optimized to run in VMware, Citrix XenServer, Xen, KVM, and other hypervisors, providing networking and security services to virtual machines and cloud computing environments. Vyatta has been downloaded over 600,000 times, has a community of hundreds of thousands of registered users and counts dozens of fortune 500 businesses among its commercial customers. What does Vyatta stand for? 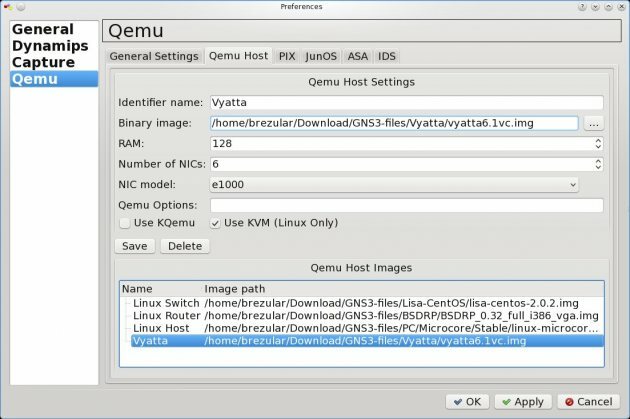 In this tutorial I would like to show install Vyatta 6.4 Core Virtualization ISO on Qemu image and run it from GNS3. Which console to use was traditionally defined automatically during install, by vyatta-grub-setup, based on which console the user was logged in on. i.e. if you install while on a serial console, your default console in grub would be the serial one. As we install Vyatta on qemu image, the first default option will always be kvm console. To change it we need to modify /opt/vyatta/sbin/vyatta-grub-setup and tell it to make serial console to be a default option whether kvm is detected or not. Edit the file /opt/vyatta/sbin/vyatta-grub-setup and find a line starting with default-console=0. Change it to 1 and save the file. The change in the script vyatta-grub-setup above does not help us much as the script is started only during install. Nevertheless, we can change directly a parameter “set default=0” in /boot/grub/grub.cfg to 1 in order to boot with serial console option. To install Live CD to Qemu image enter run an installation script. You have successfully installed Vyatta. GNS3 qemuwrapper script runs an Qemu image with random MAC address generated for Ethernet interface. Next time the Qemu image is started a new MAC address is generated for the same interface. Vyatta is programmed to save MAC address of existing Ethernet interfaces. If the new MAC address of existing interface is generated, Vyatta preserves the interface with an original MAC address and create a completely new interface with the new MAC address. For this reason, every time an Qemu instance is restarted the number of interfaces is doubled. or set a superuser password. The line adds Ethernet interfaces whose MAC addresses begin with HEX number 0 to the list of Ethernet interfaces which will be ignored even their MAC address has been changed. Enable Kvm option only if your CPU supports hardware virtualization and it is configured. Enable Kqemu option only if it is installed and running. If you are not sure with these options let them unchecked otherwise Qemu will be not started. 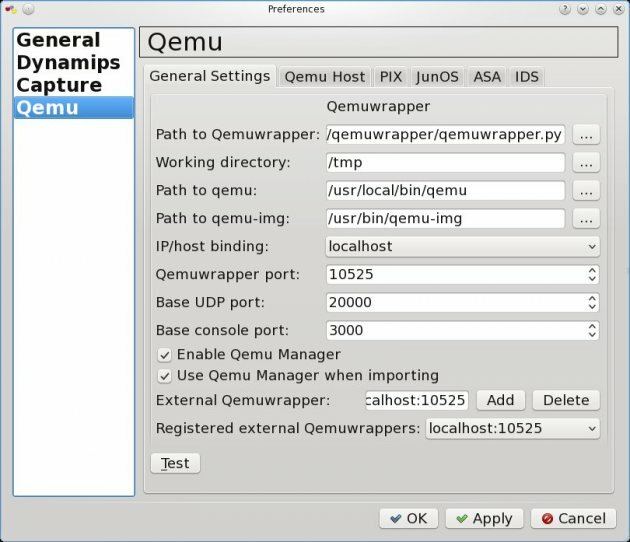 You need also set Qemu general settings like path to qemu, qemu-img and qemuwrapper. I’ve created a video to prove functionality of Yvatta 6.4 on Qemu image. In this video three Vyatta Qemu instances are running RIP routing protocol.